SEPis a machine composed by a feed device (feeding hopper or a compensator tank depending on whether the material is conveyed mechanically or pumped), a separator casing including a screw conveyor and a cylindrical screen, a compacted solid material outlet module and one or two separated liquid outlets. The drive unit and the basement complete the machine. SEPC is a machine composed by a feed device (feeding hopper or a compensator tank depending on whether the material is conveyed mechanically or pumped), a separator casing including a screw conveyor and a cylindrical screen, a compacted solid material outlet module and one or two separated liquid outlets. The drive unit and the basement complete the machine. SEP is a solids-liquid separating machine including a screw conveyor. Using both principles of separation, by gravity and by mechanical pressing, the machine is designed to separate the liquid phase from the solid phase in a wide range of substances such as sludge, sewage, manure, solids-liquid mixtures, vegetables, processing waste and others, where the percentage of liquid inside the solid may be considerably different. The separated solid and liquid phases can be handled in an easier and cheaper way. In some sectors this can even become a source of income. 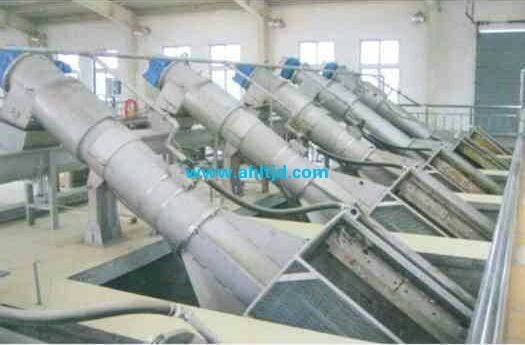 The machine receives the material to be separated and conveys it using the screw conveyor inside the separator casing. The liquid phase is separated through the mesh of the cylindrical screen which encloses the screw conveyor. Along its path toward the exit, the material gradually separates progressively the less linked liquid and then the more strongly linked liquid until a plug of almost dry material has formed before the outlet. The plug is continuously expelled through the outlet diaphragm. The inlet compensator tank for pumpable materials is a mandatory accessory and essential for an optimum operation of the machine. A lump breaker can be provided for materials such as vegetable waste which need to be reduced in small fractions to be better pressed by the machine. An electric panel with manual operation can be provided on request.